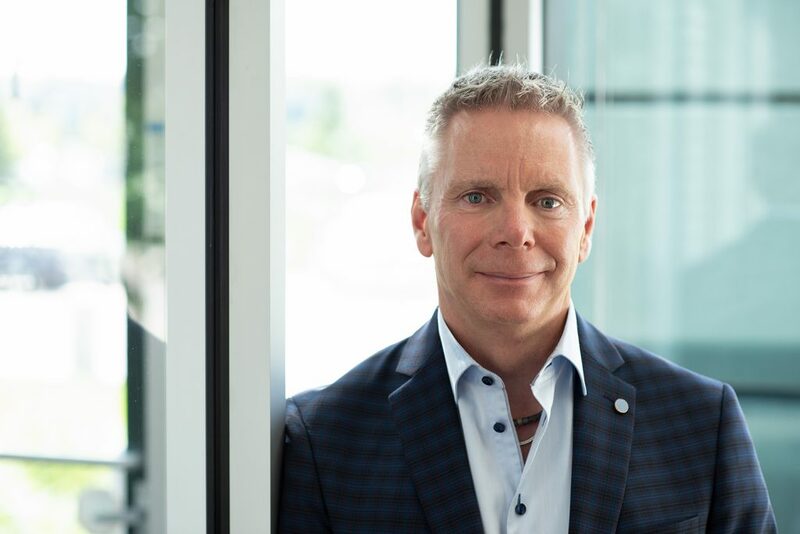 Doug McCartney has a vision for the CIC that enhances its value and relevance within Manitoba’s innovation ecosystem as well as the composites community outside the province. His goal is to build on the foundation of what the CIC already is and strategically move it in a more business-focused direction. He recognizes that the skills and competencies established within the organization are its economic currency. “The CIC is really a catalyst,” he says. “It has the ability to work directly with industries and encourage them to embrace innovation, and help them develop those types of products that can be adopted by industry.” Doug wants to take advantage of the CIC’s role in demonstrating to a broad audience the value of composite materials, including their environmental and economic advantages. In order to move towards a more business-oriented model, the CIC will be focused on developing and fostering strategic long-term partnerships. Business opportunities that exist within our traditional areas of focus – aerospace, ground vehicles and biomaterials – will continue to be the foundation of the organization. However, greater attention will be placed on identifying new industries that can benefit from composites. For example, there is potential for composites in medical devices, such as orthotics and prosthetics, as well as the application of our staff’s expertise in the development of clean technologies. Ultimately, he believes that long term success for the CIC means delivering sustainable economic outcomes on both the private and public investments that it receives. With a client centric and team-oriented approach in place, our team is excited to have Doug onboard to move the organization forward. There is a thriving composite manufacturing sector in Manitoba with products including agricultural equipment such as tractors and intercity and mass transit buses, all of which use resin transfer moulding – light (RTM-Light) as the primary manufacturing process. While a number of biofibre reinforcement materials are commercially available, none of them are suitable for RTM-Light processing. The challenge for our staff was to develop a proof-of-concept biofibre mat that can be used in the RTM-Light process. Mats for RTM-Light manufacturing consist of a thermoplastic core sandwiched between two layers of chopped strand glass mat. 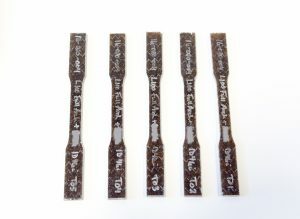 The core acts as a flow media for the resin during the infusion process, while the chopped strand mat layers provide strength and rigidity to the cured part. 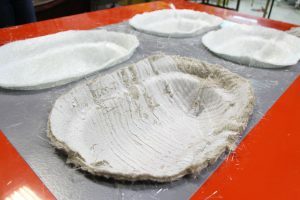 To develop a drop-in biofibre mat, the following properties were considered: conformability, resin flow, mat thickness, the ability to use the biofibre mat without any tooling or equipment changes, compatibility with commonly used resin systems, and acceptable cosmetic results in the final part. We then assessed commercially available biofibre products to see if any of them would be suitable for use in the biofibre mat. 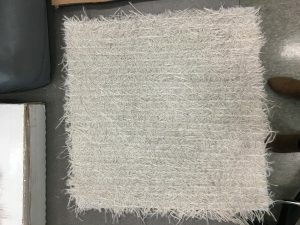 After selecting potential materials and performing initial testing, we developed a stitched mat that included a layer of a flax fibre chopped strand mat (handmade in-house), a nonwoven hemp fibre flow media layer (commercially available from BioComposites Group), and then another layer of flax fibre chopped strand mat. Several mat samples were produced and infused using the RTM-Light process to create composite panels for mechanical testing, including tensile and flexural tests. The initial results were promising when compared to the mechanical properties for the industry baseline infused glass mats. We then field-tested the mat and a demonstrator part was successfully fabricated by a local manufacturing partner, Eastside Group of Companies. 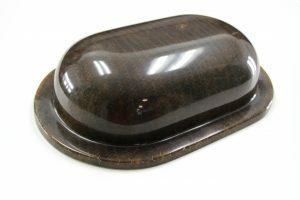 We used the prototype biofibre mat with an industry-standard tool and resin with the RTM-Light process. A good quality part was produced and the fabricator’s opinion of working with the material was very positive. The initial results for the biofibre mat are promising, but some work remains to make the material commercially-ready for use. The next steps include performing additional mechanical, environmental exposure and durability testing, and determining the feasibility for mat manufacturing scale-up.